Today I'm sharing a little Spring Break re-cap! Even though our little ladies are only in preschool, or still at home with Mama, we wanted to make this week special for them. Luckily when you have a 5, 3 and 1 year old, it's not too hard to make the day special in their eyes! It's hard to believe that NEXT year Avery will be in Kindergarten and Spring Break will really feel like a break for her. I'm cherishing every last minute of my big girl being home with us, I can't imagine not having her by my side next year! Monday: On Monday we made a trip to the Lego store, spent some time at an indoor play ground and ate lunch at California Pizza Kitchen, one of our favorites! It was a really seamless adventure, minus the fact that when I went to pay for Starbucks before leaving the mall, I realized I left my ENTIRE diaper bag at the indoor playground... yep, wallet, keys, phone, everything, just sitting at the playground, unattended for 30+ minuntes. Thank goodness for honest people, when I sprinted back to the playground... my diaper bag was right where I left it, I swear I was an extremely organized human being, BEFORE I had three children! 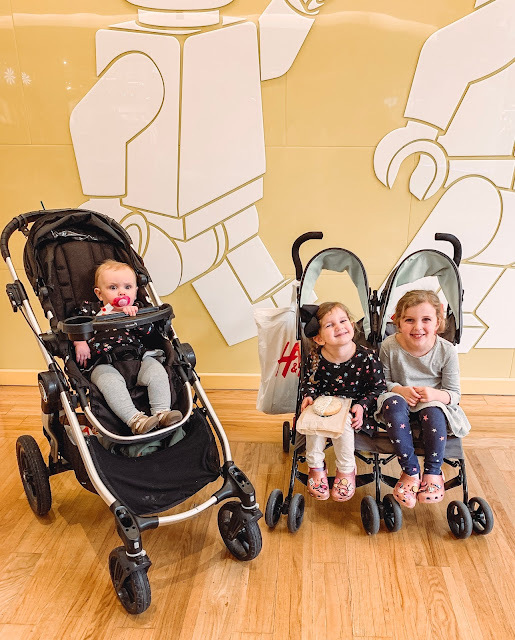 Tuesday: Avery AND Emerson spent the night at Nana's house, which was extra special because this was the first time that Emmy wanted to tag along! Nana did a great job making them feel special with a trip to Dunkin' Donuts and Barnes & Nobel before heading back home to Mama. That night, Scotty and I had so much fun hanging out with Isla, it's so weird being home alone with her! The house is so quiet and I swear she spends most of the alone time walking around looking for her big sisters. Wednesday: Sun and temps in the upper 50's meant it was time to head to the zoo! We have a zoo membership and love spending the day at the zoo. We have our zoo routine down and this was our first visit that Isla could walk around too! She was pointing at every single animal, all smiles and just SO happy to be outside with her sisters. It was the perfect day at the zoo, ending with a ride on the carousel and a quick trip through the gift shop, we can't wait for more zoo days this year. Thursday/Friday: We booked a last minute over night to one of our favorite places ever, Lake Geneva! We stayed right down town at The Cove, the same hotel we stay at when we come to visit in the summer time. We ate at our favorite restaurants, swam in the indoor pool, took a ton of walks and just enjoyed the time away as a family. Avery was SO sweet and on our drive home, I was telling her how lucky some of her friends were that they were enjoying time at the beach, well Avery turns to me and says, "Yea, but WE got to go to LAKE GENEVA!" Bless her heart, I hope she always considers driving 45 minutes to a little lake equal to the beach in Florida. Also, such a great reminder on how our kids just love to spend time as a family, it doesn't have to be over the top for them to make warm and fuzzy memories! If you find yourself in Lake Geneva, make sure to grab lunch or dinner at OakFire Pizza, it's our favorite! Sadly, our favorite ice cream shop, Scoops, wasn't open for the season, which means we are going to have to plan another night away this summer. Windy, sunny, blue mouths from Superman ice cream, but something about this family photo just makes me smile, probably because it's an extremely accurate photo of what life is really like right now! Another photo for the books... one day I'll get a great photo with my girls, ha! Yep, that's a big ole' mound of snow on the beach, gotta love "Spring" in the midwest! 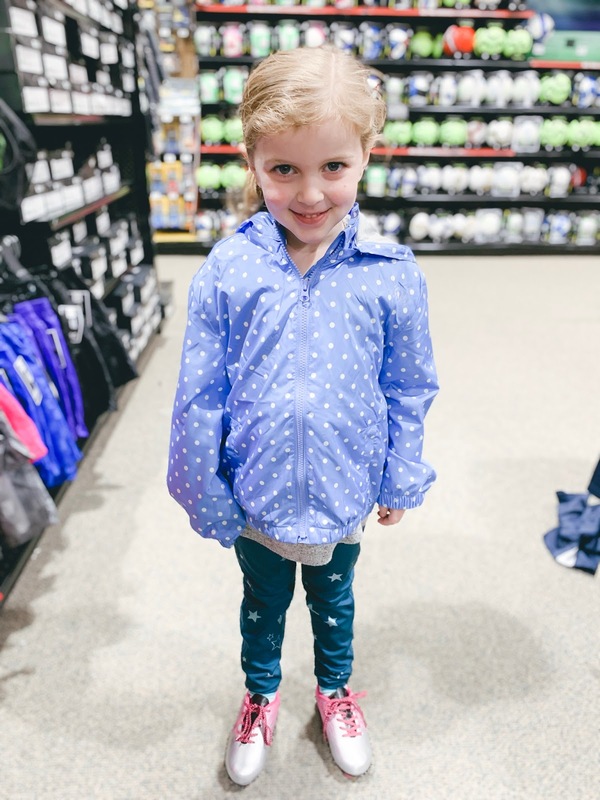 Saturday/Sunday: To wrap-up Spring Break, we enjoyed a lazy Saturday morning, ordered in our favorite breakfast sandwiches, watched the Kids Baking Championship, ran a couple errands, which included getting Avery her soccer gear and just enjoyed more time as a family! Church and a movie on Sunday, mixed in with a little NCAA basketball and taco night officially ended our Spring Break. It's back to the grind tomorrow, but I'm starting the week with a happy and grateful heart, I just love this little family of ours! If you were also on Spring Break last week, I hope you enjoyed some down time with your family. Have a great week and don't forget to follow along with our daily adventures on Instagram, I would love to connect with you! Mom Style: Wedding Guest Edt.